While you are in Prague, make sure you see at least these 3 places to get the most out of your Prague trip. It’s almost never possible for a Prague visitor not to walk on the Charles Bridge. This popular stone bridge from 15th century connects the two parts of Prague which are Lesser Town and Old Town. Being over the Valtava River on Charles Bridge, you can enjoy the beauty of Prague that Adolf Hitler couldn’t sacrifice. While walking on the Charles Bridge, you’ll encounter many street artists, musicians, or even a jazz band. This literally the center of Prague is only uncrowded –in other words truly romantic-on early mornings or late evenings. Moreover, Charles Bridge has 75 statues including John of Nepomuk, St. Ivo and St. Vitus. However most of them are not the original ones because over the centuries, natural disasters damaged the original ones. You can reach Charles Bridge by using the metro line A (Staromestska) or the trams number 17, 18 or 53. Dating back to 15th century, The Astronomical Clock, one of the most popular tourist attraction in Prague, is located one side of the Old Town Hall. On the stroke of each hour, you see a huge crowd in front of the clock to watch the procession of the Twelve Apostles. This astronomical clock is the oldest one in the world that is still working. Josef Manes added medallions of each sign of zodiac in 1865 below the Astronomical Clock which makes it more special. Along with the Astronomical Clock, The Old Town Hall Tower is one of the most attractive buildings in the city. For a stunning view of the city, you can climb the top of the tower. The Old Town Tower is open between 11:00 and 22:00 on Mondays and between 09:00-22:00 from Tuesdays to Sundays. To reach there, you can take Metro Line A to get off at Staromestka station or you can take the trams number 17, 18 or 53. For more information about the Old Town Hall Tower or the Astronomical Clock, you can visit the official web portal for Prague. If you like to get a break from the historical air of Prague, Dancing House will offer you a very “modern” experience. Built in 1997, the building “Dancing House” is used as on office but it is one of the most interesting tourist attraction in the city. When you see the Dancing House, you may be surprised how it can remain standing but it continues to stand by Vlatava River and surprise the visitors for nearly 20 years. The main material of the building is glass and only the top floor of the building is open to visitors. The other floors are occupied by the international companies. 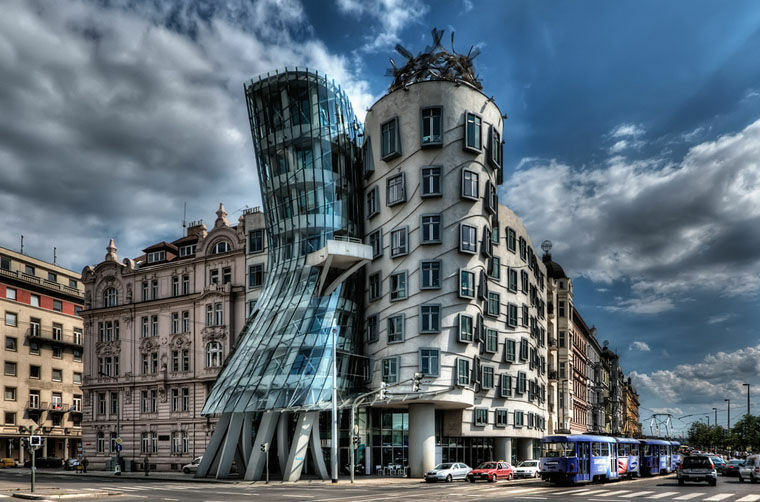 The architects of the Dancing House, Milunic and Gehry were inspired by the famous dancers couple Ginger & Fred so the building is also known after their names and represents their dancing. To see this fascinating building, you can take Metro Line B and get off at Malostranske namesti or you can take the trams number 14, 17 or 21 to get off at Jiraskovo namesti.